Why Should You Invest in the Surviveware Fire Starter? "Great, bacon-saving fire starter, and affordable too!" "I really liked the length of the rod, it's much easier to strike than the smaller ones out there" "My husband taught me to start my very first fire with this. I got a fire after only a few tries!" This fire survival fire start is the real solution to your preparedness needs! EASY TO USE! This from a happy customer - My wife and daughter started using the fire starter with no previous training and had a fire started in 15 minutes after I showed them the technique!" PLUS, the Magnesium Fire Starter comes with a FREE PDF guide with invaluable tricks to help you get your fire started. BREAKTHROUGH! This review from another satisfied customer: "I'm not kidding, I own a few different emergency fire making tools, like waterproof matches, flint, and steel, I've have tried them all over the years and this is probably my favorite so far." MULTIPLE USES! This flint like starter can be used for more than just emergency. It can also use this to ignite your camp stove, BBQ grill, fireplace, and building a fire from nothing can be fun and educational for the kids too. NEWSPAPERS & MEDIA LOVE OUR FIRE STARTER! Our product has been featured on CBS, NBC FOX and hundreds of other news sources. You risk nothing. Our fire starter comes with a 100% no-nonsense 60-day money back guarantee. LONG ROD! Unlike the majority of fire steel flint which are maddeningly short our fire starter is longer than most other options. You can get maximum amount of spark with minimum effort and in an emergency the clock is ticking and getting your fire started quickly is crucial. THICK AND ROBUST! Because this magnesium ferro rod is thicker than most of the cheaper ones out there you are guaranteed with 12 000 strikes. When an emergency happens you need to work sparingly and conserve your supplies, but since you have a thick rod to work with you can afford to make some mistakes. WORKABLE EMERGENCY WHISTLE! 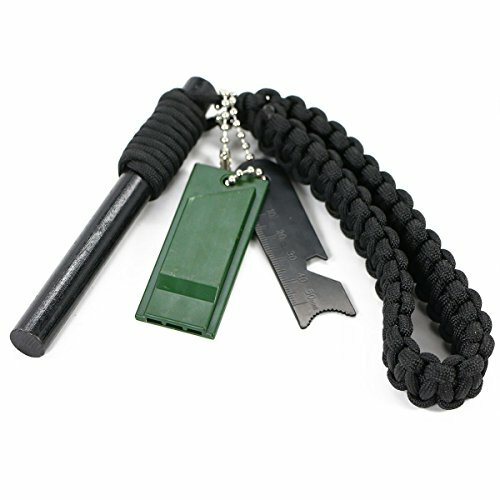 Unlike some of our competitors that offer fancy whistles that do not work, our survival whistle is tried, trusted and easy to use. When faced with an emergency attract attention to yourself immediately. QUALITY GUARANTEED! Unlike cheaper fire starters made from poor materials that fail to provide the necessary sparks for fire starting, you can rest assured that the Surviveware Fire Rod as your back. With a no questions asked 60-day-money-back-guarantee you risk absolutely nothing. If you have any questions about this product by Surviveware, contact us by completing and submitting the form below. If you are looking for a specif part number, please include it with your message.